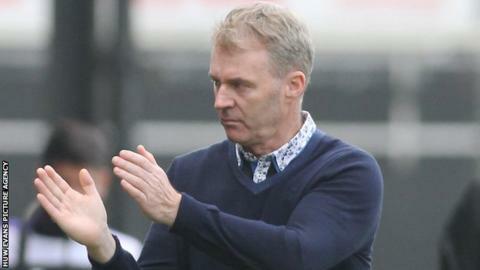 John Sheridan says Newport's 1-1 draw against Exeter will give them confidence ahead of a tough schedule. Sheridan replaced Terry Butcher on Friday and saw his new side earn a valuable point 24 hours later. Newport remain bottom of League Two with five of their next seven games against current top 10 sides. "I looked at the next seven games we've got and we couldn't have got many harder, which I'd rather have," he said. "If we play like that we'll compete with most teams in this league. "By all accounts they've been playing okay - they've just not been getting results." Joel Grant gave Exeter the lead but Lenell John-Lewis' equaliser rescued a point for the Exiles at Rodney Parade. Sheridan praised striker John-Lewis, who joined County from Grimsby Town on a two-year deal in May 2015. "His all-round performance leading the line was excellent," Sheridan added. "I like my centre-forwards to play as a centre forward. "I like players to be brave. Just be brave and don't worry if you're doing the right things and you make a mistake, don't worry about it." Sheridan's team are away to sixth placed Mansfield Town on Saturday, 10 September and host Portsmouth the following week.